What makes Mobi by Shaw Go such a great, if not the best, option for short trips around the city? Well, you might be surprised to learn that trips up to five kilometres in urban areas are often faster and more convienient by bicycle than they are by car or transit. We're serious! See the graph below or check out this study. When you consider the time a driver spends sitting in traffic, looking for parking, and walking to their end destination you can bet that they frequently underestimate their commute time. So instead of getting frustrated with congestion in the city and showing up late why not put the joy back into your commute and arrive on time with Mobi. Have a friend who is thinking of giving bicycle commuting a try? You can refer a friend and recieve $10 riding credit. To highlight the fact that Mobi is fast and convenient we're showcasing different routes around the city that take under 30 min. Today's route will take you from Strathcona to Kitsilano which is possible due to our expansion into East Vancouver. Miss our previous Mobi on Over in 30 routes? Check out Commercial Drive to English Bay and Victoria Drive to Granville Island. Let's pretend it was pouring rain this morning and commuting into work by bicycle didn't feel like an option, in fact, you probably don't even need to pretend. Skip ahead a few hours and at last the work is done, the sun is out and you're having a beer with co-workers at Strathcona Brewery. A typical Vancouver day. Now it's time to make your way to Kitsilano, maybe you have dinner plans at Corduroy or you call this neighbouhood home, but your without your bicycle, the bus route isn't great, and rush hour congestion still hasn't cleared making car share an expensive hassle. 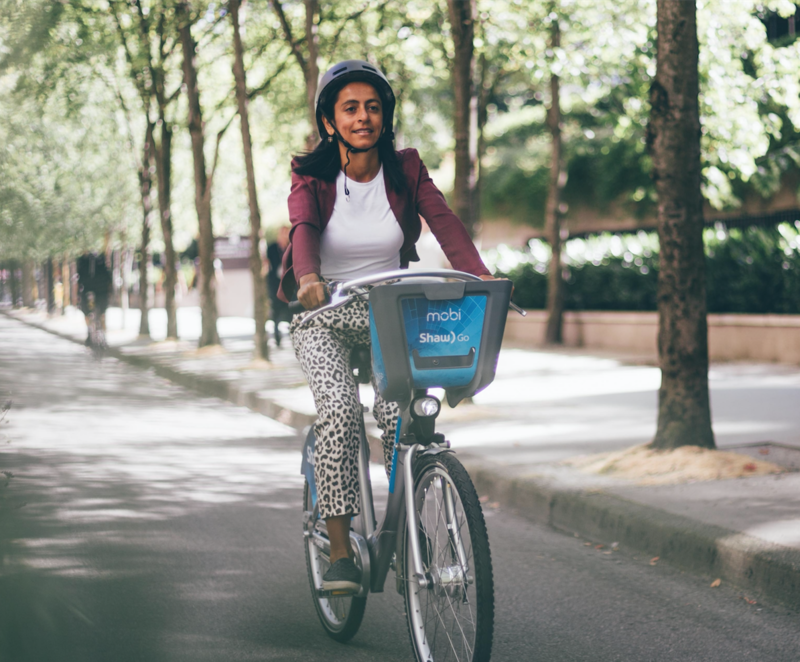 With our East Vancouver expansion in full swing you'll soon see Mobi By Shaw Go stations throughout Strathcona making it easy to commute from here to Kitsilano. The route below might not be the fastest but it makes great use of Vancouver's protected bike lanes. After a thirst quenching beverage with co-workers at Strathcona Brewery, it's time to make your way Kitsilano. For a trip of this length taking a bike is your fastest option! Mobi at your service! This is one of our favourite parts of the city to ride a bike through! We're so happy to be making bicycles more accessible in Vancouver's oldest residential neighbourhood. You've made a right onto Union Street. This designated bike route is always busy with cyclists. About to pass someone? Spin the black ring around the base of the bell to give a friendly warning. Here you want make a slight left to join the Georgia Street Viaduct. We're sure you've heard the viaducts won't be around for much longer. Enjoy the view as you ride over them, while it lasts. As you enter the downtown core you might be curious about how long you've been riding or how many KM's you've done. Hit the green Enter button to display this information on the screen. If it asks for your PIN afterwards, just ignore this prompt for now. It's been a bit of an uphill battle to this point. Got a backpack on? Why not make use of the basket and give your back a break. Use the bungee cord to keep it secure. To make a left onto the Hornby Street protected bike lane you'll need to make use of the bike box. A bike box is a green painted square used to orient bicyclists properly for safe crossings. As you ride down the Hornby Street protected bike lane you'll pass Robson Square. This downtown plaza is worth eating lunch at one day. It's an extraordinary piece of architecture and is always lively. Onto the Burrard Street, another protected bike route. The Burrard Bridge was the busiest bike route among all of the locations where bike counters can be found in Canada and the United States. As you come to the intersection of Cornwall and Burrard you're officially in Kitsilano. Make a right onto Cornwall and don't forget to signal. Your trip ends here! Dock and be done. We’re here when you need us again.